or fill out our Coastal Mississippi Online Air Conditioning Heat pump service request form. We also offer AC service contracts. An AC service contract can level your yearly expenses for AC and heating service in the Coastal Mississippi area. Our trained technicians can keep your system running properly and efficiently. 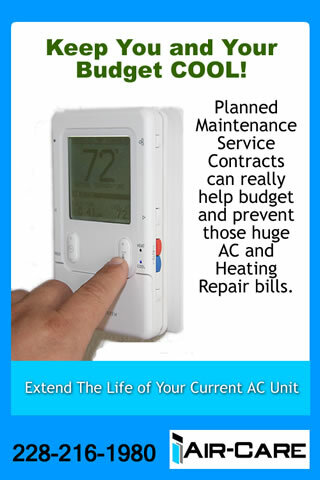 In fact many people save money on their energy bills by improving efficiency of their AC system. A preventative maintenance agreement will keep your system preforming properly as long as possible. It will also be reliable and efficient. A clean and properly functioning AC will always run more efficiently than a dirty AC that has not been cleaned or serviced. We can start new AC Repair Service maintenance agreement all along South Mississippi including Bay St. Louis, Gulfport, Biloxi, Waveland, Long Beach,Pass Christian, and other areas near the coast.